This is the tiniest crested form of the famous "Golden Barrel Cactus". A dwarf form covered by touch friendly spines and looking quite dissimilar to the standard species. 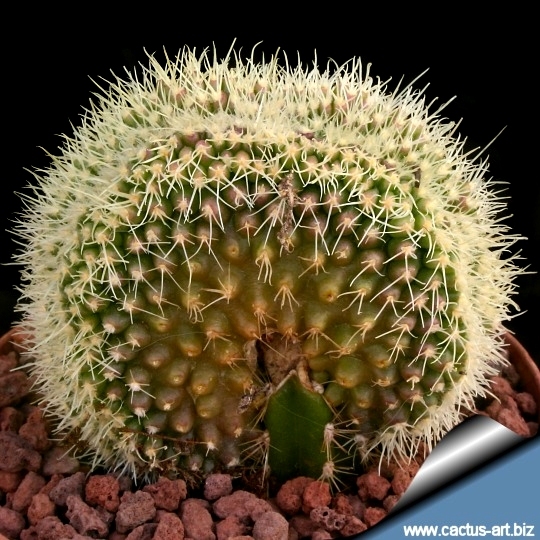 Description: This is a very nice crested cactus, easily recognizable for its short yellowish bristly soft spines. The standard "Golden Barrel Cactus" (E. grusonii) is a large spherical barrel cactus with imposing strong yellow spines, and one of one of the more common an known cacti. This species is widely cultivated and gave rise to a number of different cultivars, monstrose and crested forms. The E. grusonii forma minor cristata - here described - is the smallest and delicate crested variant, quite rare in collection and priced for its reduced size and touch friendly covering of soft spines, it will form tangled brain-like green mounds and can reach a considerable size (up to 30 cm tall and in diameter, or more ). Spines: It has few short and more or less twisted spines, bristly, glassy pale-yellowhis spines all quite similar in shape, that loosely cover the surface of the stems. Vernacular Names: Crested Golden barrel cactus (dwarf form) also known as Golden ball cactus, Mother-in-law's-seat, Mother-in-law's-cushion. This is a different and very rare cultivar, with short thin spines. The cause of cresting: The cause of cresting is not fully explained. Biologists disagree as to why some plants grow in this unusual form. Some speculate that it is a genetic mutation. Others say it is the result of a strike of lightning or freeze damage, but whatever the stimulus, the growth point of the stem has switched from a geometric point, to a line, which folds and undulates as the crest expands. 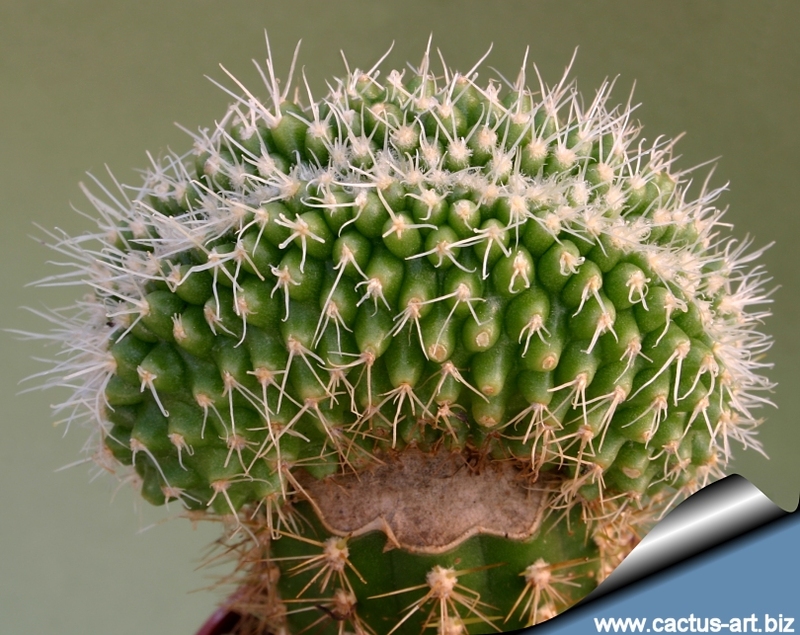 Though these crested E. grusonii are rare, cresting occurs naturally, and can be encountered in many other cactus species.